With a foreword by Mike Askew, formerly Professor of Mathematics Education at King’s College London, and now Professor of Primary Education at Monash University. AER 59 reviews research into aspects of mathematics teaching, focusing on issues relevant to Australian mathematics teachers, to those who support them, and also to those who make policy decisions about mathematics teaching. It was motivated by and draws on the proceedings of the well-attended and highly successful ACER Research Conference Teaching mathematics? Make it count: What research tells us about effective mathematics teaching and learning, held in Melbourne in August 2010. 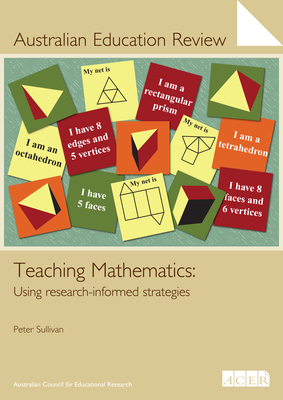 Section 2 describes the goals of teaching mathematics and argues that a practical orientation should be the focus of mathematics teaching in the compulsory years, and outlines the contribution numeracy-based perspectives can make to schooling. Section 3 uses assessment data to evaluate how well those goals are being met in Australia and introduces the challenge of seeking equity of opportunity in mathematics teaching and learning. Section 4 expands on the importance, to individuals and society, of achieving the mathematics goals; and Section 5 discusses six research-based principles of mathematics teaching. Section 6 argues for the importance of well-chosen mathematical tasks in supporting student learning, and models tasks and particular teaching strategies. Sections 7 and 8 analyse research which provides insights into a key issue facing Australian mathematics teachers, that of finding ways to address the needs of heterogeneous groups of students. Section 9 describes and recommends particular emphases and strategies for education programs for both prospective and practising teachers.